Bow = 8 x 4 x 2"
Shocking Pink Grosgrain Ribbon 2.25"
Shocking Pink Hair Bow and Matching Striped Beach Towel. Every young girl would love this matching set! The bow is a 2.25" wide grosgrain shocking pink that is attached to a French clip. 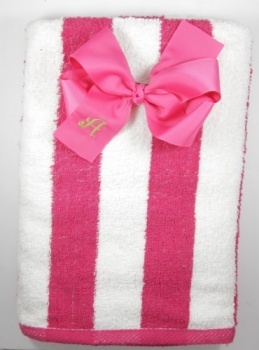 The towel is a striped pink and white cotton towel that will look great for the pool or beach trip. She will know this is her bow and her towel, just add the embroidery feature for 2 lines if you want both items to be embroidered, the bow does show the 1" first initial in a Mono curls font.